Brassica microgreens should be consumed as often as you can because they provide a range of micronutrients, according to scientists at ARS.USDA. ARS scientists analyzed micro- and macro-nutrients in 30 different varieties of Brassica microgreens, such as red cabbage microgreens. Click the image for more information about it. Yaguang (Sunny) Luo, a food technologist at the Food Quality Laboratory in Beltsville, Maryland, led a team of scientists that conducted the mineral analyses of the Brassica microgreen varieties. Eton Codling, a research agronomist at the Adaptive Cropping Systems Laboratory, also in Beltsville, and Zhenlei Xiao, a postdoctoral researcher, collaborated with Luo. Both laboratories are part of USDA’s Agricultural Research Service (ARS). Microgreens are the young seedlings of vegetables and herbs. They are harvested with the seed’s original leaves intact, very soon after these first true leaves emerge. The Brassica microgreens analyzed in this study included arugula, broccoli, kale, radish, red cabbage and wasabi. Essential minerals are a class of nutrients important for human health that are obtained from dietary sources. There are two groups of these essential minerals: microelements (also known as “trace elements,” such as iron, zinc, copper and manganese) and macroelements (such as calcium, magnesium, phosphorus, potassium and sodium). Luo and her research team found that mineral concentrations in Brassica microgreens varied by species and variety. The most abundant macroelement found in the microgreen samples was potassium, followed by phosphorus, calcium, magnesium and sodium. 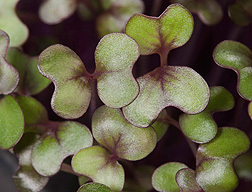 Potassium values were highest in wasabi microgreens and lowest in daikon radish microgreens. Savoy cabbage microgreens had the highest calcium levels.